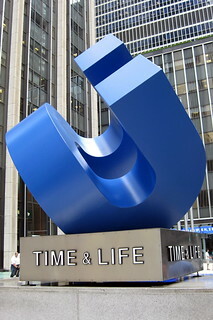 Cubed Curve, a large, blue metal sculpture by William Crovello outside the Time-Life Building at 1271 Avenue of the Americas ws originally commissioned by the Association for a Better New York and installed in 1972. The Time-Life Building, at 1261 6th Avenue, was built in 1958 to the design of Wallace K. Harrison of Harrison & Abramovitz. The 587-foot tall modernist office tower was the first building in the Rockefeller Center extension plan. At the time of its completion, the building was the tallest slabformed skyscraper in the city and i's 48-floors of 2,600 m² were the largest in the world thanks to the column-free interior spaces, with the support columns rising outside the curtain wall, at 8.53 m intervals. Time-Life occupied 21 floors, with the rest rented out to various tenants--fictiously including the advertising firm Sterling Cooper Draper Pryce from the AMC television series, Mad Men. The Time-Life Building is set back 82-feet from Sixth Avenue and 33-feet from 50th Street, creating streetside plaza spaces which are paved with a wavy-effect multicolour mosaic which extends to the inside lobby. the 16-foot high lobby makes extensive use of stainless steel panelling and features large murals by Fritz Glamer and Joseph Albers.